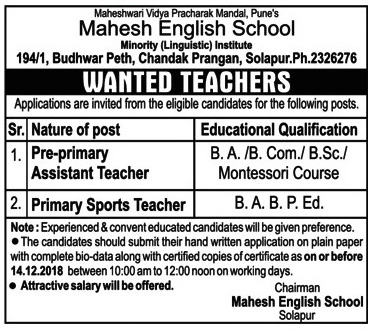 Mahesh English School, Solapur has advertised in the LOKMAT newspaper for recruitment of Teachers jobs vacancies. Interested and eligible job aspirants are requested to apply on or before 14th December 2018. Check out further more details below. How to Apply: Interested and eligible candidates are required to submit their handwritten application on plain paper with complete bio-data along with certified copies of certificates and recent PP size photos to the walk-in address mentioned below.